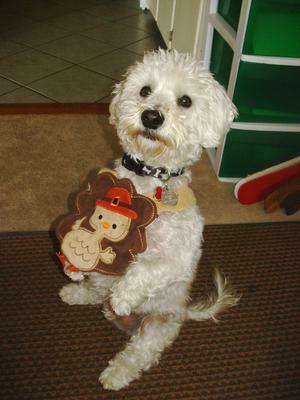 Pogo is ALWAYS ready for dinner - especially on Thanksgiving! 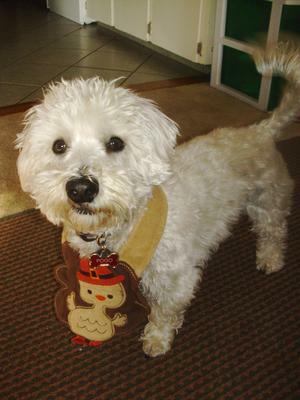 He will gladly put on a silly turkey bib to make sure he is noticed...and will sit and "perform" (BEG) for as long as it takes to get a treat! How can anyone say NO to a face like this??? Comments for Pogo is Ready for Thanksgiving Dinner! 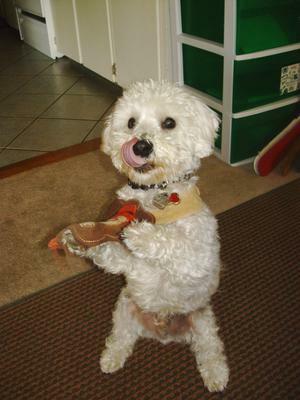 Pogo you are so darned cute I sure hope you got lots of treats. Pogo, you are a handsome boy.. If you came for thanksgiving dinner in Socrates, he will definitely share his turkey with you. You are a cute boy. Have a nice Coton day! Wow. That is is really good sit up. It almost looks like a little human. Adorable pic.